built the duchy into a significant power. Attribution: nl:Afbeelding:ErcoleIdEste.jpg, uploaded by nl:Gebruiker:Känsterle [Public domain], via Wikimedia Commons. Niccolò’s case study example of a hereditary principality is Ferrara under the Este Family. Ferrara was typical of cities whose commune became a principality and its rulers, the Este family, which ruled as lords and then dukes from 1264 to 1597 was a prototype lineage of hereditary princes. The Este were a noble (war-lord) family, which took its name from the family castle at Este, built in the 11th century, on the eastern branch of the Po River near Padua. The Este family gained a foothold in Ferrara when Obzzio I (who died in 1193) managed to marry his son Azzo V to one of the two rival families in that city. In 1264 Obzzio II had himself named perpetual Lord of Ferrara by the “people” of the city. He later also became Lord of Modena (in 1288) and Lord of Reggio (in 1289). Members of the family continued to rule as lords of the three cities until Borso Este became the first Duke. Borso (like many local rulers in Italy at the time) profited from the rivalry between the Holy Roman Emperor and the Pope. In 1452, the Holy Roman Emperor, Fredrick III made him Duke of Modena and Reggio and in 1471, Pope Paul II made him Duke of Ferrara. The rivalry between the Pope and Emperor, which Borso exploited, illustrates an important process that formed Italy as Machiavelli knew it. Italy developed differently than did the continent north of the Alps. In most of northern Europe, as feudalism declined, power devolved into local power centers, which eventually coalesced into larger units that would become the monarchies of England, France, and Spain. In Italy and Germany, however, the process was distorted by the unique institution of the Papacy. Popes naturally resisted the neighboring power that was most likely to be a serious rival, the Holy Roman Empire. Pope and Emperor battled over the centuries and polarized nearly every region of northern Italy into two rival factions, the Guelphs and the Ghibellines, respectively. Both sides lacked the power to eliminate the other and as a result, power devolved into small local centers. Cities in particular, benefited from the stalemate between the pope and the emperor, because both competed in granting favors to the cities in return for their support. As a rule, the Emperor granted away the privileges that the cities owed to the Pope and vice versa. The long rein (1471-1505) of Borso’s successor, Ercole I, gave him ample time to enhance the productive organization of his state and to strengthen his control without straining his available resources. This enabled him to survive a coup attempt (by Niccolò son of and Leonello) and an attack (1482-1484) by an alliance of Venice and Pope Sixtus IV, which ended in the Peace of Bagnolo. 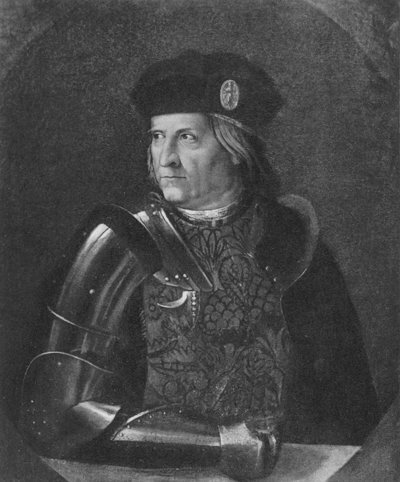 The last Duke of Ferrara, Modena and Reggio to rule during Niccolò’s lifetime was Alfonso I, who ruled from 1505-1534. Owing to the strong foundations of his family’s rule, Alfonso survived a conspiracy by stepbrother Giulio and another by his brother Ferrante, and had them imprisoned for life. He was able to field a strong military. His artillery made important contributions to the League of Cambri war that Pope Julius II mounted against Venice in 1509 and his navy won the Battle of Polesella. Later Alfonzo came into conflict with the Papacy as an indirect result of the 1499 invasion and occupation of Milan by Louis XII, King of France. Alfonzo was a French ally as was the Pope in the League of Cambri. However, after accepting French help in the League of Cambri war (against Venice), Pope Julius formed the Holy League to drive the French from Italy. Because Alfonzo remained a French ally, the Pope excommunicated him and officially deprived him of Modena (in 1510) and Reggio (in 1512). However, even though the two Medici Popes (Leo X, Pope from 1513 to 1521 and Clement VII, Pope from 1523 to 1534) remained enemies of the Este, Alfonso regained Reggio in 1523 and Modena in 1527. Outliving Clement by 7 years, Alfonso was able to pass his state to his son Ercole II.